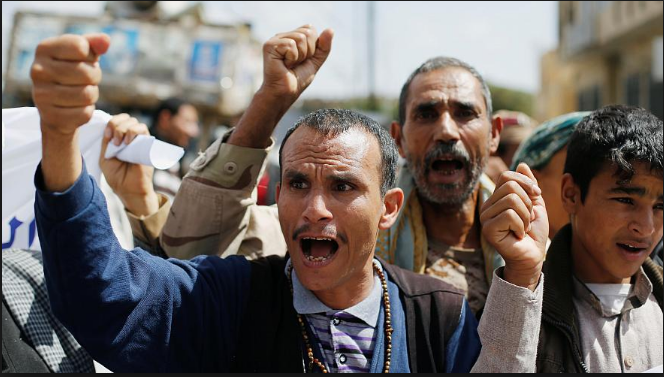 Sheikhs and Tribesmen of Taiz province on Sunday held a protest rally to condemn the war crimes committed by Saudi aggression and its mercenaries against the Yemeni people. The participants, at the rally, stressed on the importance of backing the army with money and fighters to confront the aggression. They affirmed that killing children and women, targeting the elements of life and imposing a blockade on the Yemeni people are war crimes. The rally held the United Nations and humanitarian organizations the responsibility for prosecuting the war criminals against the Yemeni citizens, calling on stopping the war and lifting siege imposed on the Yemenis. In March 2015, the US–Saudi coalition started a war against Yemen with the declared aim of crushing the Houthi Ansarullah movement, who had taken over from the staunch Riyadh ally and fugitive former president Abd Rabbuh Mansur Hadi, while also seeking to secure the Saudi border with its southern neighbor. Three years and over 600,000 dead and injured Yemeni people and prevented the patients from travelling abroad for treatment and blocked the entry of medicine into the war-torn country.